True Detective was an instant success since it was first published in 1950, and continues to be a favorite of the crime enthusiast. This is the one and only true crime magazine with reliable reports on criminals of today. The magazine outlines the investigative techniques used to fight the criminal. Read fascinating reports on classic crimes. Find out about solving closed cases years after the crime took place. We are all fascinated by crime and the criminal. Each issue of True Detective magazine delivers all that the amateur investigator wants to solve the crime and catch the criminal. Follow well researched articles of crimes currently being investigated with reports to the reader. Each article includes pictures of the crime scene, factual reports of the investigation, and reviews of the forensic techniques used to solve the murder. Read the interviews from the criminal, the investigator, and others. Get updates to current cases and developments in current, unsolved investigations. For those interested in classic crimes, read the factual reports about why it wasn’t solved and how it could be solved today with modern techniques. Read about colorful outlaws like Bonnie and Clyde or John Dillinger. Discover details that could have solved the case. 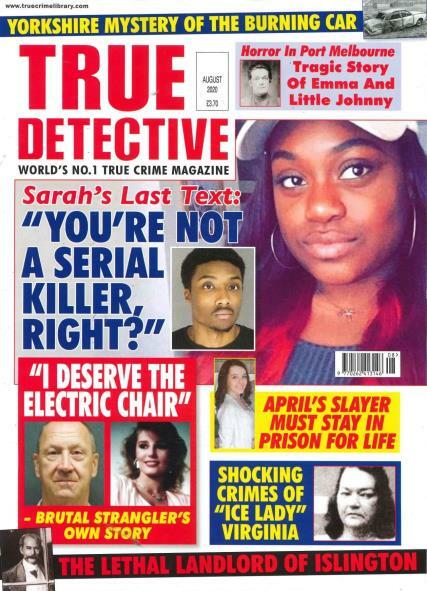 True Detective Magazine If you're interested in true crime stories then this is a great magazine. Despite the rather sensational looking covers the articles are intelligently written and well researched. Unlike many other magazines it isn't packed full of adverts. There is loads to read, it's like buying a book of short stories. There are lots of pictures related to each story that help set the scene for you. There's a great selection of modern and vintage crime stories, and often if there are new developments you'll find an update in later issues. There are the other standard magazine items such as a letters page and regular competitions that add a bit of variety and help build a sense of community with the readers. At less that £3 a copy you won't be disappointed, this isn't a magazine you read in 10 minutes then throw away. I always take one on holiday with me, they're great to read on long flights.